Making the decision to switch from the Bass Pro Elite Series to the FLW Tour has allowed for summer baseball games. With a full-time job as a project manager for a fabrication company, Jamie didn’t want to take extended periods of time off to accommodate the West Coast swing and the tournaments in the northeast so he made the decision to switch from the Bass Pro Elite series to the FLW Tour in order to accommodate his schedule. He says "The FLW schedule is more manageable with almost one tournament per month. With the Elites, some of those back-to-back situations means you’re gone a month at a time and that makes it difficult. With stricter qualification criteria for the 2015 FLW Tour, that left him with no way into the field other than to be placed on a waiting list. 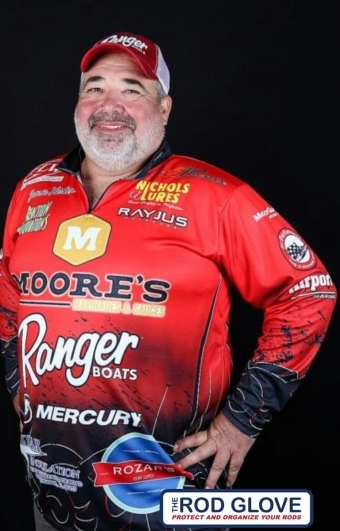 He declined that option and instead fished the Southeastern Division of the FLW Series and the Alabama River Southern Open. Jamie started fishing tournaments when he was 27yrs old and enjoyed it so much that he made it part of his lifestyle. Now that he has Grandchildren, he is enjoying the FLW series as it allows him to work his full-time of 40 hours per week and still have time to catch the summer baseball games of his granddaughter and his nephew. With plenty of years of Elite Bass Pro experience under his belt, Jamie is doing well in the 2016 FLW Walmart Series as he is currently sitting in 11th place overall. His next tournament will be on his home territory of Pickwick Lake and there are a total of six more tournaments in which he still has a chance to move up in the overall standings. When asked how he uses his Rod Gloves while on Tour, Jamie says he protects each rod with a Rod Glove and also keeps extra Rod Gloves on hand for his co-anglers in order for them to protect their rods. In the off season, Jamie Horton is a beloved fan of the University of Alabama football team. I love the Bait Glove – it keeps hooks out of my seats! And of course helps with tangled rods. And The Rod Wrapz are great when taking rods out of the boat and into the house or into a friends boat.